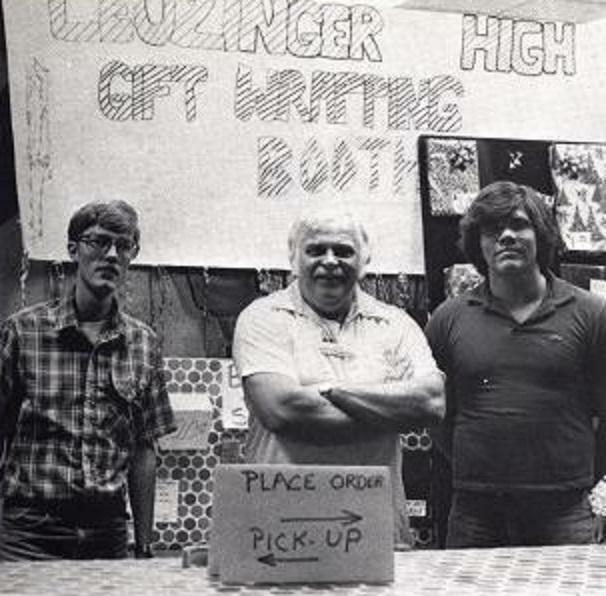 Thanks for the gargantuan efforts of Mr Cameron, the on-again, off again Leuzinger High School Gift-Wrapping Booth turned out to be a great success. The "Big Bear" took the bull by the horns and coordinated an efficient, well-oiled operation. We have all benefited from the good public relations by such community activity. Many clubs and classes participated in this year's booth. The resulting income will be well used throughout the year. Once again, the PTA put in many hours of fine service during the daytime shifts. A vote of appreciation once again to Mr Cameron and all those who assisted him in his determined effort to turn a difficult situation into a profitable, worthwhile event. Photo: Mr Cameron is flanked by two Olympian volunteers - James Carver and Tony Diaz - at the Leuzinger High School Gift-Wrapping Booth located inside The Hawthorne Plaza shopping mall.